Home » Economy & Development » China’s tourism push – Does every city really need a new old town? China’s tourism push – Does every city really need a new old town? Yesterday we looked at a few of the pros and cons of rural life, today we’ll be looking at the development plan for this region. 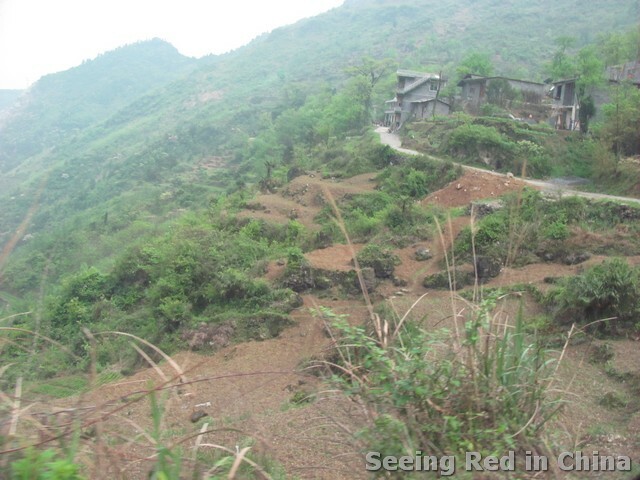 “China is a large country with a large population,” seemed to be the catch-all excuse for much of the poverty we saw as we traveled through rural parts of a central Chinese province. * While I generally find it an unconvincing dodge, the remoteness of this region lead me to contemplate how it could ever be prosperous. Many of China’s remote regions were settled exactly because they were so difficult to reach, offering minority groups and small clans protection from outsiders. But now that trade and manufacturing are the base of China’s growth, these rural places have been left behind. 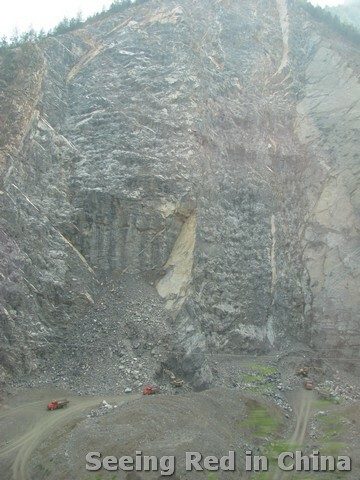 One village we visited was located on what was essentially a cliff that could hold no more than a few dozen homes. 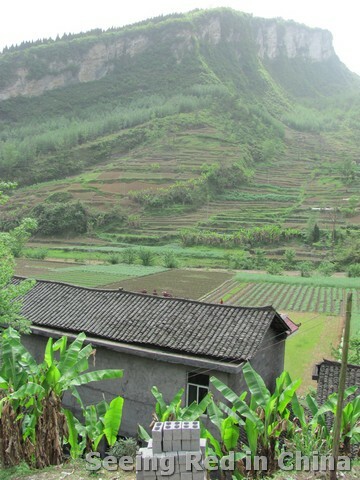 They farmed in the narrow valley below, growing mostly rice and corn for their own consumption. It’s difficult to imagine a way for such a remote place to prosper; in the US it would have been turned into a nature reserve long ago. The local gov’t officials told me that their current plan was to try to grow tourism. Given that the “city” (that managed the tiny village) was located on a narrow two-lane road, it seemed like a more realistic vision than expanding heavy industry or manufacturing. Currently the region is mostly cash crop farming, with a few cement plants and a handful of mining operations. These industries though are quickly cannibalizing the mountains that the new plan relies on. It seems though that tourism has become the focus of every small town in China. While this region did have some spectacular views, the closest airport was two hours away and is already seated in an area that has world famous scenery and well developed infrastructure for tourists. The city I was visiting only offered scenic drives on rough dirt roads. Furthermore, every city between this small one and that tourist hub was focusing on tourism too. It seems that 10 years ago, as domestic tourism was just starting to grow, the entry cost was much more attractive to farmers and villagers, and many decided to build small restaurants and guest houses. Now when you pass these places you see dozens of worn down, empty hotels standing in the shadows of big shiny new ones. Domestic tourists have much higher standards now and are uninterested in staying in what the villagers can afford to build (Jeremiah Jenne wrote a great post that explored a few other angles of tourism). It’s also important to note that even though there are more and more domestic tourists, many of them have very little time and money for travel. When I talk with my Chinese friends about the vacations I have taken to the countryside, I’m often met with confused looks. Why would I ever visit a poor area when I could just as easily see a rich one? Why would I visit some county no one had heard of when a famous one was nearby? Chinese tourists seem to put a very high value on checking well-known sites off their lists as travel is very much a status symbol (Evan Osnos’s hilarious account of traveling with a Chinese tour company to Europe). Additionally, this area lacked most of the key ingredients for becoming a tourist hot spot – It was not the site of an important ancient city or religious site, and had no preserved old town like Lijiang or Xi’an (but they were planning on building a new old town at the villagers expense, like many other cities in China); it did not have “famous” scenery, meaning that it was not a destination for poets or painters of the past; and it is still too rustic to attract those seeking something more luxurious like Shenzhen or Shanghai. I worry that the hundreds (thousands?) of villages seeking to develop tourism will fail at massive costs to their villagers. “Each day, thousands of visitors come to see the ruined Xuankou Middle School and leave flowers, but they depart quickly. Perhaps it’s not a coincidence that the more prosperous villages I’ve visited aren’t focused on tourism, they are focused on cash crops and adding further value to the raw goods they are producing (like milling wheat and using the flour to make frozen mantou to sell throughout China, or growing kiwis and bottling the juice). It’s as if China has leapt from one rural development model to the next without much thought of how it would actually work. Next week we’ll be looking at some of the projects I visited on this trip and discussing the state of the rural church. *I’m being intentionally vague here. By T in Economy & Development on May 18, 2012 . The leitmotiv “Let’s become a touristic village” is spreading for the same reasons casinos and lotteries always had (not only in China). It’s a “Let’s become rich quick” scheme I’ve seen so many times all along the Mediterranean sea, especially on the poorest regions of Italy and Spain (never been to Greece but I guess it’s the same). And you are right, it doesn’t work! It is not surprising that they develop each old town in the area. The local government can even create an old town if they want. They just want to show their achievement to get an uper position. It is a Mianzi (face) project.